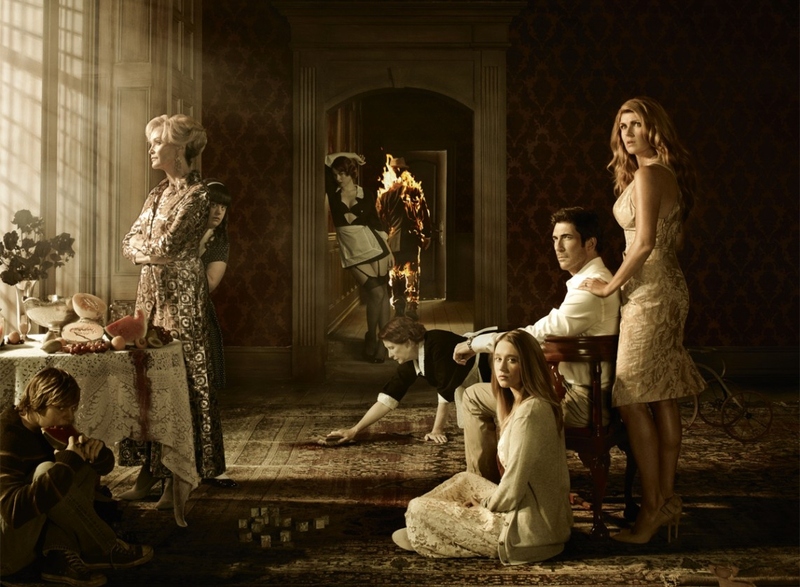 GUILTY PLEASURE: American Horror Story: Murder House is a bloody mess – but it’s hard to look away. DISCLAIMER: Yes, I realise the first season of American Horror Story – titled Murder House – first aired in 2011. But I’ve only just gotten around to watching it. Please forgive the lateness. Two days in bed with the flu saw me get through it, so here’s my two cents. And there’s no spoilers, so read on if you’re yet to see it. Stylistically, the first season of FX’s hit television series American Horror Story feels like one of its gruesome murder scenes. It’s a bloody mess. It’s both an exercise in excess and a homage to just about every horror movie ever made. It’s a guilty pleasure. But for horror fans, it’s like a big bowl of carbohydrates – ultimately unsatisfying. But why couldn’t I stop watching? Unlike other modern television shows, each season of AHS is a self-contained story. The subsequent seasons see the introduction of a new setting, plot and characters, and principal cast members return to play different roles. Season two, Asylum, takes place in an asylum. Crazy. Murder House has a beautifully executed (mind the pun) opening sequence set in 1978. Two brattish ranga twins venture into the so-called “Murder House” and fatefully wander its darkened basement. Then we fast forward to the present day in which the Harmon family – dad Ben (Dylan McDermott), mum Vivien (Connie Britton) and angst-ridden teen Violet (Vera Farmiga’s younger sister Taissa) – move from Boston to Los Angeles to rebuild their lives after the loss of a baby and a subsequent act of infidelity. They’re moving into a lovely old home that has, to use a gross understatement, a checkered history. Each episode peels back more of this Murder House’s horrific, blood-soaked history, revealing numerous characters from different eras and a seemingly limitless catalogue of evil acts. These violent events ripple into the Harmon’s lives and it is soon apparent that the victims and persecutors of the past still dwell within the historic home’s cursed walls. Visually, Murder House is an absolute feast. As a viewer, there are endless visceral moments to sink your teeth into. The directors, which include co-creator Ryan Murphy (of Nip/Tuck and Glee fame) and experienced television director David Semel (Heroes, Buffy the Vampire Slayer, Dawson’s Creek etc), have given the material a dense, mesmerising quality that goes a long way to selling the abstract, supernatural elements of the narrative. The production values are high. MAID OF HORROR: Alexandra Breckenridge is sinful as the young, prettier maid Moira. Murder House banks on two of its best features to engage its audience. The first is the mysteries of the plot. By setting up a lot of creepy, unexplained scares – many of which, as you would expect, leap from darkened corners – the viewer is enticed to keep watching, and learn the fate and origins of the show’s damned spectral personalities. Each episode drip feeds you historical information and, for the most part, this tactic works. The second feature is the strength and conviction of the cast. McDermott, Britton and Farmiga deliver their lines with palpable emotion and, most importantly, a very straight face. As the core of the show, its crucial that the audience care about these three people. It may come down to personal choice but, sadly, not every viewer will find them interesting or likeable enough to wade through all 12 episodes of this first season. 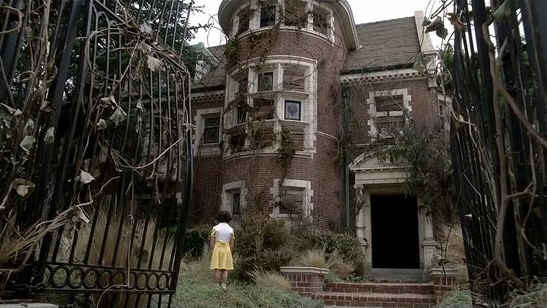 SPOOKY: The central location of American Horror Story – the infamous Murder House. Murder House very quickly descends into a molasses of over-the-top indulgence. The writers throw every cliche at the canvas and hope that they stick. The show’s major flaw is the absence of a focused tone. The creators want Murder House to be too many things. They want it to scare the audience. They want it to disgust the audience. But they also want it to intrigue the audience and even make the audience laugh. The early episodes are deliberately abstract, moulding an atmosphere and a world in which the viewer accepts that anything is possible. This is crucial to “the haunted house genre”, because you must overcome the biggest obstacle. It’s a simple question: “Why doesn’t the family just leave?” Every haunted house tale has to face up to this reasonable query and figure out a way to answer it. For the most part, Murder House disguises these contrivances. But the tone of the series jolts when it introduces a dark sense of kooky humour. For every scare there is a bizarre moment that is either silly or absurd. The tone is muddled. The tone is unfocused. The series is prosaic, but in a frustrating way. And, crucially, there are too many characters. Some appear quite regularly, others are summoned at convenient times when they are required to serve the plot. But none of them receive enough screen time to ever become sympathetic. Some are comic reliefs, others are designed to leach sympathy from the viewer. The house is a menagerie of tortured souls – and there’s just no room at the inn. By remaining cryptic throughout most of the 12 episodes, Murder House keeps the audience at a distance in which it’s difficult to connect with the story or characters on anything more than a surface level. In the supernatural genre, the biggest sell is the suspension of disbelief. But the writers have not honed their method in which to do so. Are we watching a horror show? Are we watching a black comedy? An absurdist comedy? A mystery? A satire on the American dream? Creators Murphy and Brad Falchuck would likely answer that AHS is all of these things, but this really means there are too many balls for Murder House‘s juggling act to effectively keep in the air. This season makes you appreciate the genius of David Lynch and the originality and balance he brought to the first season of Twin Peaks. Murphy and Falchuck would clearly love for Murder House to be mentioned in the same breath as Lynch’s landmark series. The cast of oddball characters. The dark mystery. The dream sequences. The flashbacks. The balance of tension and humour. But Murder House is not in the same league as Twin Peaks. They haven’t captured the very distinct, coherent and original tone of Twin Peaks, which allowed its plot and characterisation to dictate the unsettling atmosphere rather than Lynch forcing it down the viewer’s throat with clever editing and sound effects. GOING BATTY: Dylan McDermott is frequently bare-chested in American Horror Story: Murder House. Horror fans lick their lips at a good genre reference or homage, and Murder House is bursting at the seams with them. You can take your pick, really. The first season of American Horror Story references The Shining, Rosemary’s Baby, Frankenstein, Beetlejuice, The Amityville Horror, The Others, Carrie, A Nightmare on Elm Street, plus the real life Richard Speck murder spree of the 1960s. It’s easy to borrow visuals and perpetuate cliches, but you can also have original ideas and a coherent plot. The twists, turns and out-of-the-blue revelations of Murder House give the impression that the writers were changing their minds on the show’s direction with each new episode. It might keep the audience guessing, but it’s also off-putting. AMERICAN PSYCHO: Evan Peters plays Tate, a rather troubled teenager. There’s a very strong supporting cast and they all relish their screen time. The uber-cute Kate Mara (sister of Rooney) has a lot of fun with stalker-obsessive Hayden, Zachary Quinto minces with camp glee as Chad, Mena Suvari makes a brief but unforgettable appearance as an aspiring actress and Morris Chestnut has a reassuring presence as a home security guard. Alexandra Breckenridge is frequently jaw-dropping as the seductive red-headed young maid Moira (there’s an older version of Moira, played by Frances Conroy, and the two interchange appearance without any explanation – supernatural or otherwise). Jessica Lange reminds us what a stunning actress she is as the truly wicked Constance Langdon, a role for which she deservedly won a Golden Globe and Emmy. Denis O’Hare plays Larry Harvey and, after his scene-stealing turn as True Blood‘s arch villain Russell Edgington, is one of the few characters that seems effectively written and pitched on the odd wavelength that the producers intended for Murder House. Special mention should be given to Downs syndrome actress Jamie Brewer, who does a fine job as Adelaide Landgon. 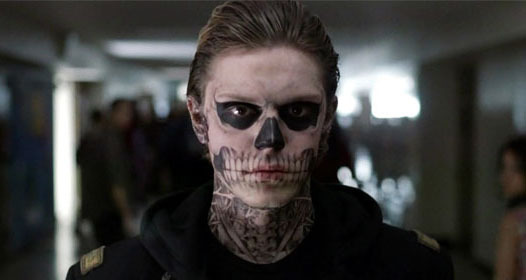 Evan Peters, as the psychotic Tate, does his best to squeeze sympathy from a very unsympathetic role. Though impressive on paper, the show may have resonated further if there were less characters and a larger focus on adding depth and nuances to the principal cast. Despite its flaws, I did plough through all 12 episodes of AHS‘s first season. Part of me desperately wanted there to be a delicious pay-off. After burying my arms up to the elbows in the season’s thick, crimson soup I hoped to find a method to its madness. A startling right hook that validated this whole gloriously over-the-top effort in television. But Murder House attempts to straddle comedy and horror, and never really nails either. There are some killer one-liners. There are some memorable moments. There are some under-used elements. By the final scene, you won’t have regretted entering the Murder House but you will be acutely aware of how much better it could have been if it had narrowed its scope. Intriguingly, you will want to watch second season American Horror Story: Asylum to find out if the creators manage to serve up a more clearly defined vision. This desire to enter the asylum surely means that, while being a god-awful, the first season succeeds in getting under your skin. ← Does Neil Young owe you his hits? No, he doesn’t.